Demonstrators protest pension reform proposed by Brazilian President Michel Temer’s government, Sao Paulo, Brazil, Feb. 19, 2018 (AP photo by Andre Penner). On Feb. 19, Brazil’s government announced it was abandoning an effort to reform the pension system, which is a main driver of its ballooning deficit. 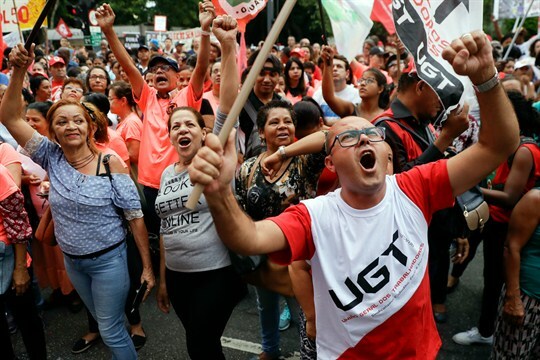 Though the official reason was the military intervention launched last month in Rio de Janeiro state, which makes constitutional amendments impossible to act on, the reform effort was widely understood to have little chance of success. The failure of Michel Temer, Brazil’s exceedingly unpopular president, to deliver on a key promise prompted credit ratings agencies to downgrade Brazil further below investment grade. In an email interview, Paulo Sotero, director of the Brazil Institute at the Woodrow Wilson International Center for Scholars, discusses why the effort never gained traction and what its failure means for the economy and presidential elections scheduled for Oct. 7.